While I was in Arizona last week (running a study group for this year's Arizona Winter School on perfectoid spaces), I took the opportunity to visit another world, 50 minutes outside of Tucson. 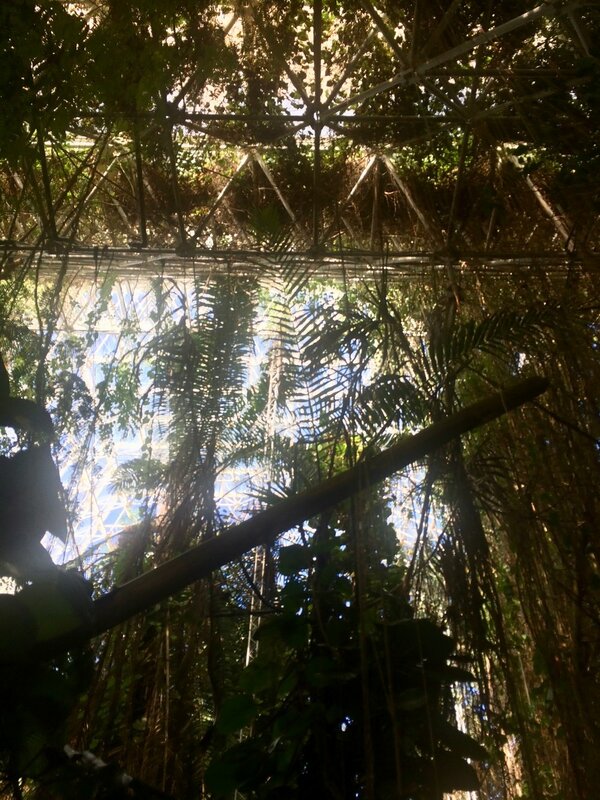 Dreamt up by a group of experimental theater performers and environmental scientists -- a group based at Synergia Ranch, whom some have referred to as a cult -- and funded by idiosyncratic billionaire Ed Bass, Biosphere 2 is an unbelievable achievement and a heart-breaking failure. It housed two missions as an almost entirely closed ecosystem between 1991 and 1994, but due to mismanagement from its founders and Steve Bannon (now White House chief strategist), as well as sabotage from without, it was eventually opened to the outside world. After five years of management by Columbia University (and some litigation between Columbia and its funder, Ed Bass), management was transferred to the University of Arizona, which now runs it as both an environmental research site and a tourist attraction. 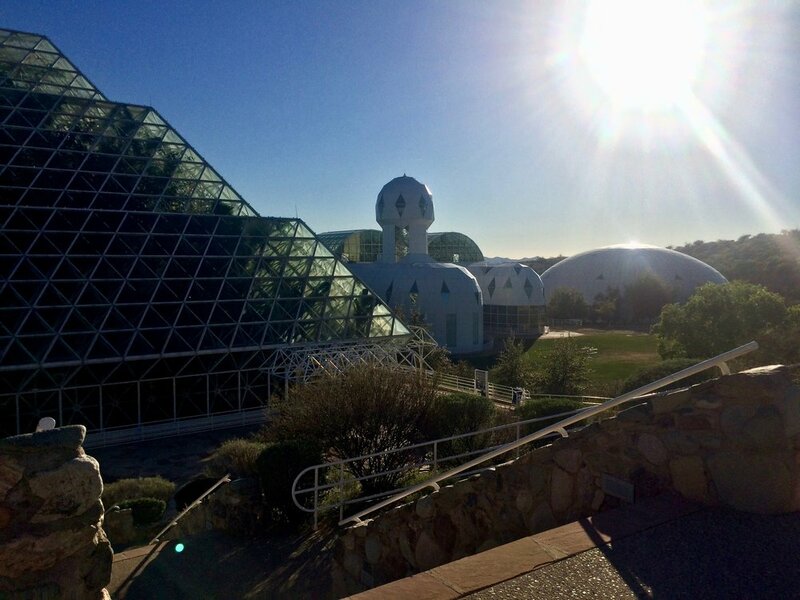 I wrote an earlier post on closed ecosystems, with Biosphere 2 as the prime example. 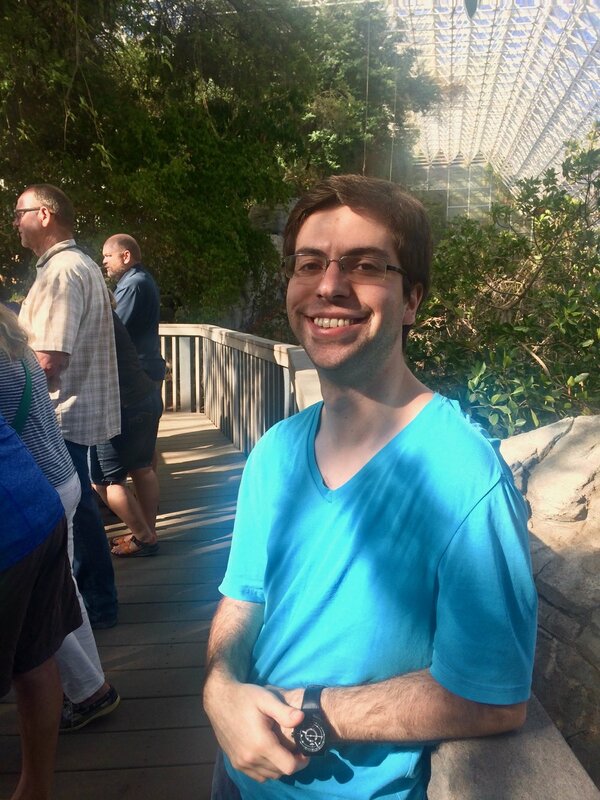 This post is a tour of Biosphere 2's history and facilities; I took all the pictures here except those explicitly marked to the contrary. I've gotten most of my information on the incredible history of this place from Rebecca Reider's excellent book Dreaming the Biosphere: The Theater of All Possibilities, as the tour was almost devoid of historical information. I suspect this is part of the University of Arizona's attempt to rebrand after the high-profile disasters of the original missions, but to me at least, the interest in the facility is largely in its history. 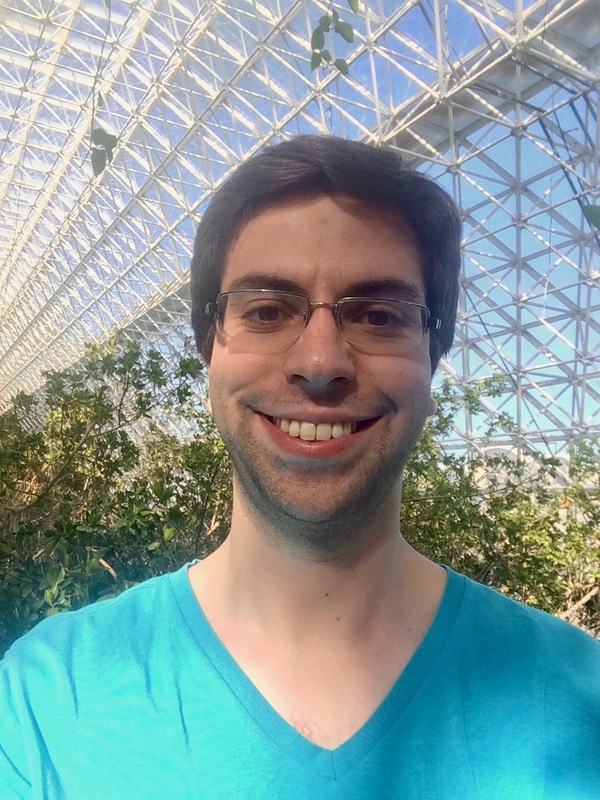 My impression after the visit was that little serious environmental research has taken place in Biosphere 2 over its 30-year history -- but the anthropological value of its story is immense. This post will also be in part a review of Reider's book. 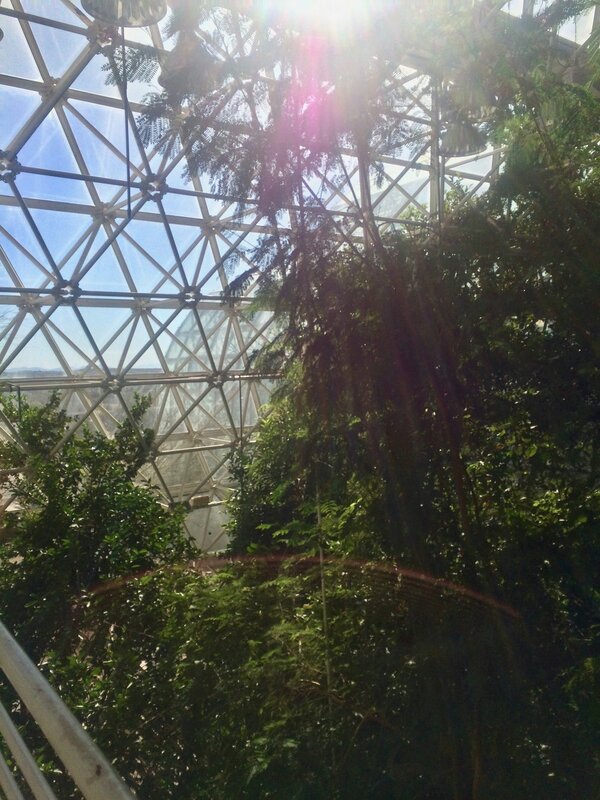 There are a few other books on the Biosphere, including The Human Experiment: Two Years and Twenty Minutes Inside Biosphere 2, by Jane Poynter, one of the original Biospherians, as well as multiple books by John Allen, the charismatic mastermind behind Biosphere 2 and the leader of Mission Control for the original team of biospherians. Biosphere 2 was originally divided into five wilderness biomes: Rainforest, Savanna, Desert, Ocean, and Marsh, as well as the Intensive Agriculture Biome, which the University of Arizona has turned into the Landscape Evolution Observatory -- essentially a large research lab where scientists will eventually study how landscapes are influenced by biological processes. The rainforest (pictured in the four photos above) seems to be the biome whose form most matches the designers' original vision. It is, however, overrun by morning glories, which the biospherians introduced because of their beautiful purple flowers. 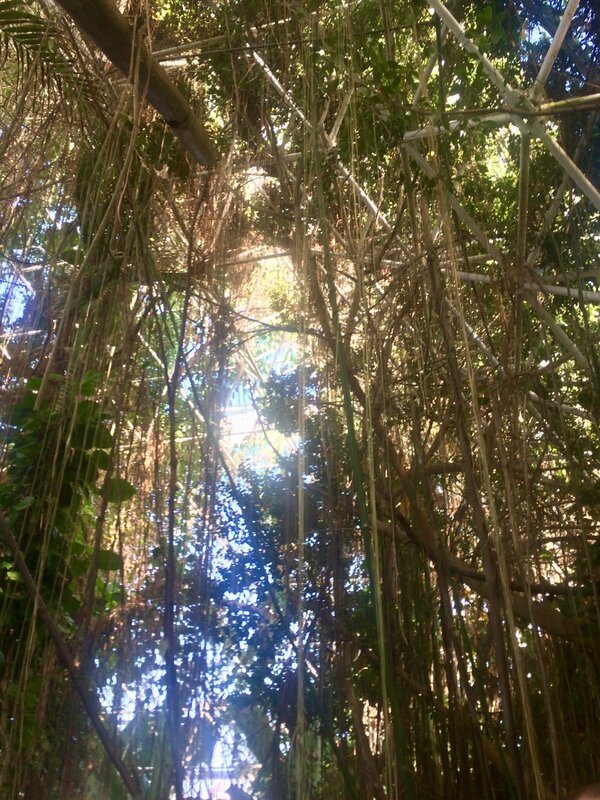 These vines are, however, quite invasive -- apparently the University of Arizona scientists now maintaining the biosphere must engage in a labor-intensive purge of the plants every few months. This sort of unintended consequence is endemic in the biosphere. Currently, the rainforest plays host to drought experiments, which study the water sources preferred by plants under varying conditions -- different water sources are labeled by deuterium and then tracked. The savanna is pictured in the six photos above (two of which contain yours truly). You may notice that it contains more trees than a typical savanna. During the original two-year mission, an excess of microbes in the soil caused oxygen levels in the Biosphere to decline precipitously, in tandem with rising carbon dioxide levels. In an attempt to ward off suffocation, the biospheres began planting trees in the savanna -- their attempt was not successful. More on this later. The ocean and marsh are adjacent to the savanna -- unfortunately the marsh was too far from the boardwalk (built by Columbia during their tenure managing the biosphere in order to open it up to tourists) to take any reasonable pictures. I've included two pictures of the ocean above, which U of A scientists are currently modifying by increasing the salinity and decreasing the temperature (reading between the lines, it seems this is an attempt to reduce heating costs). The ocean is home to several species of fish -- the tour guide blithely informed us that the managing scientists were "curious to see if they would survive the transition," which is a far cry from the biosphere founders' original ethos. One interesting feature of the ocean is a "wave machine," which at regular intervals produces an ominous groan and a 3-to-4 inch high wave which traverses the ocean; it's hidden behind the rock wall on the right hand side of the pictures above. The desert (pictured in the three photos above) is apparently more humid than it once was -- during the biospherians' original tenure, it was watered by fog machines. Later management has replaced these with sprinklers, and our tour guide described being soaked to the bone during an early morning walk through the biome. The biosphere is surrounded by desert, but the interior desert is of a visibly different character; it is cool and pleasant -- and utterly useless for supporting the biospherians. It's a testament to the original designer's commitment to representing the entire earth, independent of its utility. The desert also houses the entrance to the technosphere, 2 underground acres of machinery which supports the biosphere and which once supported its human inhabitants, including carbon dioxide scrubbers (which eventually proved insufficient to the task), heat exchangers, and, most impressively, the lungs of the biosphere. As the building was originally almost entirely sealed, it would have been vulnerable to changes in pressure; in order to avoid blown out windows, broken seals, or other structural damage, the designers decided that some part of the building would have to expand and contract with changes in internal pressure. 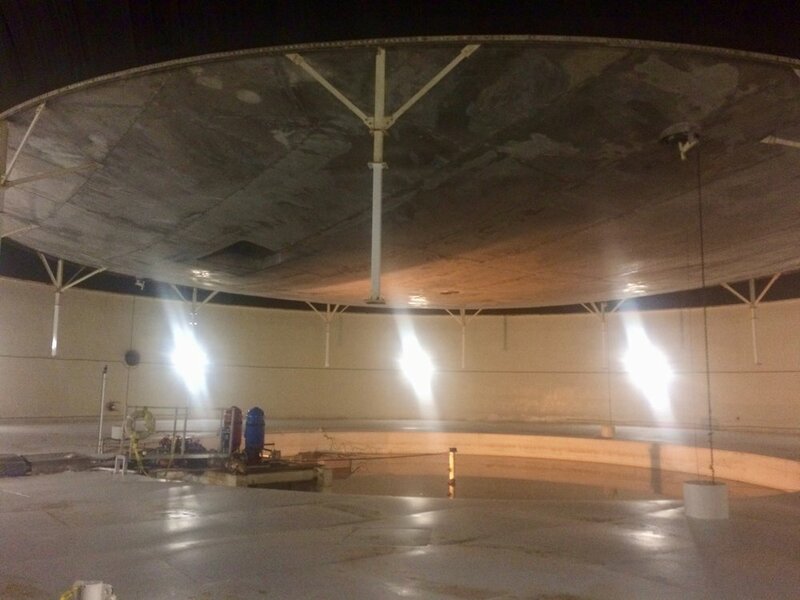 Thus the lungs (one of which is pictured in the second photo above): two giant rooms with immense rubber roofs, holding up a 16-ton aluminum cap. 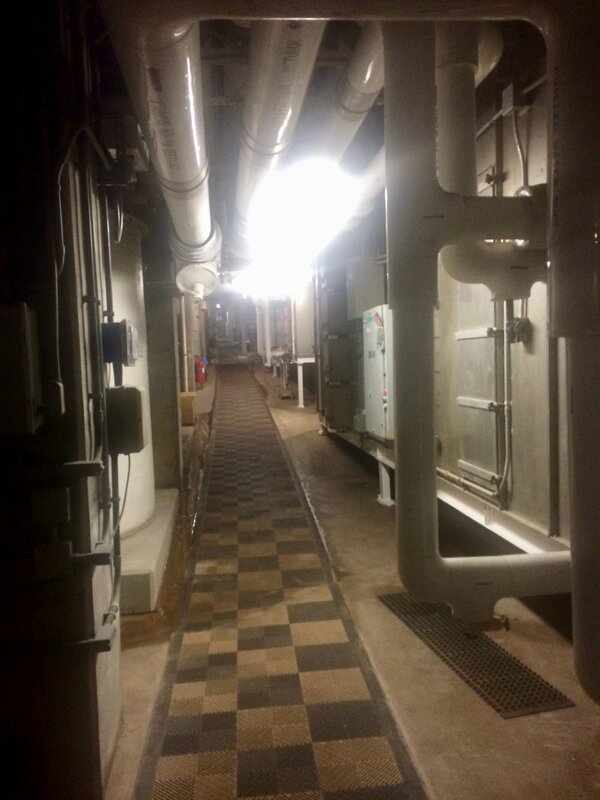 While the building is no longer sealed, the lungs are currently inflated by two fans -- and when one opens or closes a door anywhere in the facility, they visibly shrink or grow. 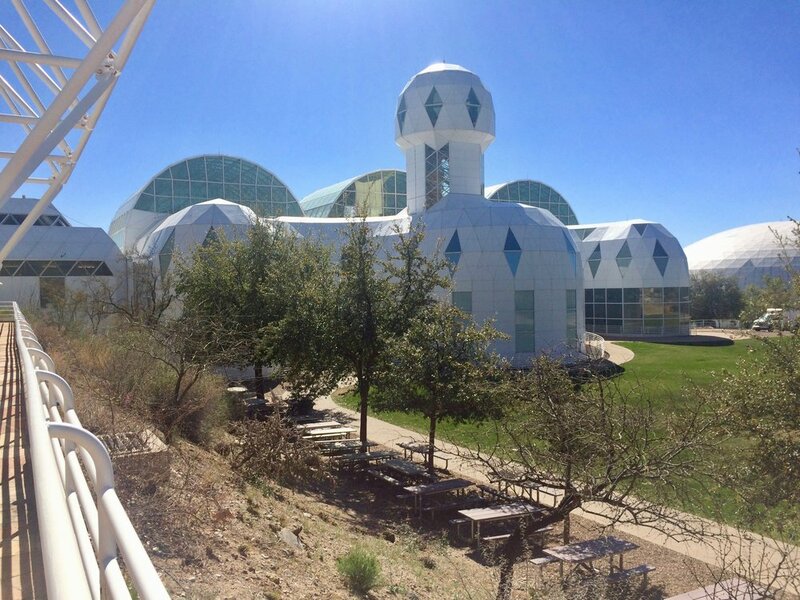 The name "technosphere," by the way, is a hint at the philosophy of the residents of Synergia Ranch, many of whom took part in the biosphere's design -- they felt that technology would eventually work in harmony with nature, and Biosphere 2 was meant to be a proof of concept. 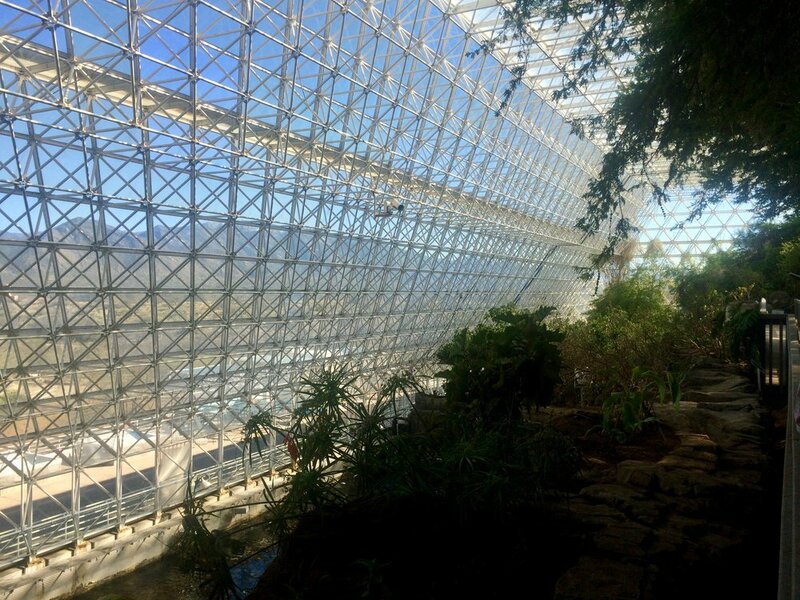 Perhaps the most impressive aspect of the facility is only visible from Biosphere 1 -- the outside world. 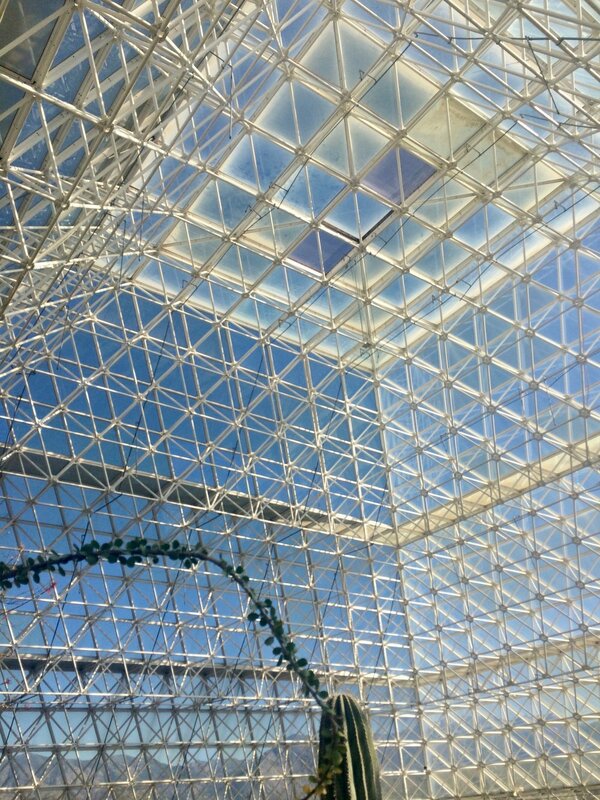 The building is clearly the work of visionaries: massive, beautiful, and weird. The six pictures above are views of different parts of the biosphere. Note that the lung (in the fourth picture above) is contained in a dome. This is because the rubber ceiling was not made to withstand the elements. The tour guide claimed that, covered, it is expected to last 99 years (from the original date of construction, circa 1990). 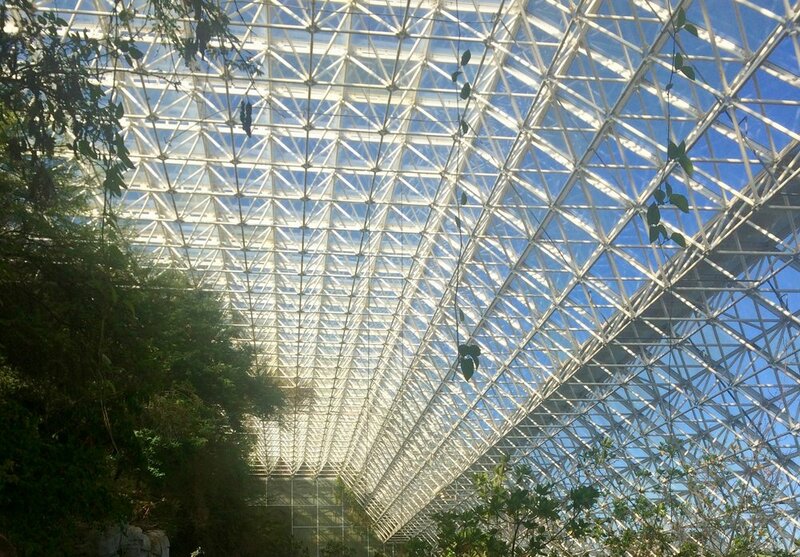 The fifth picture is of the exterior of the human habitat -- in the next section, on the fraught history of Biosphere 2, I'll include some pictures of its interior. It seems that the original biospherians expected their two-year stay in the biosphere to be quite comfortable. And indeed, no expense was spared in making sure this would be the case -- while of course the vast majority of the $150 million spent by Ed Bass on the construction of the project went to other things, he did not skimp on creature comforts. Below is a picture of the original biospherians' kitchen (complete with kitchen island), and a view of one of the individual two-story apartments each resident was housed in. Not lavish, but not bad. So when the original crew of eight -- Abigail Alling, Linda Leigh, Taber MacCallum, Mark Nelson, Jane Poynter, Sally Silverstone, Mark Van Thillo, and Roy Walford -- entered the biosphere, they had no idea what they were getting into. Some of the smaller problems included: the coral in the ocean bleached; the marsh water, filled with organics, mixed with the salty ocean water; the salinity of the water throughout the biosphere increased; and carbonic acid in the biosphere's artificial rain accumulated to such an extent that the biosphere experienced the equivalent of 200 years of acid rain weathering during its original two year mission. But when the biospherians began to starve, these concerns faded. The original plan was to survive on a diet of mostly vegetables, with some meat and animal products produced by the small amount of livestock kept in the intensive agriculture biome (pictured below). But an "unusually cloudy El Nino" limited the amount of sunlight available to the eighteen crops grown by the farmers; broad mites killed their potato crop; the lack of wind and insect life meant the biospherians had to pollinate their crops one flower at a time. They were working 70-hour weeks, essentially subsistence farming. And still, they lost weight. Some of the group begged mission control to send them food. Eventually, a year into the mission, they began to eat their emergency seed stock. Famine had entered their new world. Roy Walford, the group's doctor, referred to their food situation as a "healthy starvation diet," in what may have been a fit of wishful thinking. On average, the men in the group lost 18 percent of their body weight; the largest, Taber MacCallum, entered the biosphere at 208 pounds and left at 150. As most of their crops failed, they adopted a diet consisting mostly of beets, "lab-lab beans," and sweet potatoes, causing their skin to turn orange. Poynter (from whose book the title of this section is taken) claims in a video, currently playing on a loop in the biosphere's exhibit center, that the diet was low in calories but high in nutrition -- but I can't help but wonder if the interpersonal problems that eventually plagued the group were in part a result of their empty stomachs. We have precise statistics on the weight loss the crew underwent because the biospherians tracked everything about their environment -- and they soon found that food wasn't the only thing they were running out of. Over the first year of their mission, the oxygen level in the biosphere's atmosphere dropped from 21% to 14% -- equivalent to an elevation of 17,000 feet. The crew members started to pant as they climbed the stairs; four of them developed sleep apnea; Roy Walford, their doctor, was affected so severely that he couldn't add a column of single digit numbers in his head. Even worse, the biospherians had no idea where their oxygen was going. They quickly figured out that microbes in the soil were metabolizing oxygen and excreting carbon dioxide at a faster rate than expected -- the microbes had discovered the rich manure in the intensive agriculture biome, and had started to multiply out of control. But for some reason the concentration of carbon dioxide in the atmosphere was increasing much faster than the concentration of oxygen was decreasing. Without knowing where the oxygen was going, the biospherians could not recover it. They began to plant trees in the savanna -- irreparably altering their precious wilderness biomes -- and stopped irrigating the farm, hoping that they could sequester some carbon dioxide. They grew as much plant matter as possible, reaped it, and stored it in the basement technosphere, trying to keep the \(CO_2\) concentration down. Eventually, they discovered that some of the concrete in the biosphere had not fully cured before they sealed the biosphere. As it continued curing, it bonded with 7 tons of oxygen in the biosphere's atmosphere. But this discovery came too late; their funder, Ed Bass, was forced to send trucks of oxygen to the biosphere, and enough was injected into the West Lung to raise the oxygen levels in the facility to 19%. The crisis was over, but suffocation had done what starvation could not -- it had forced the biospherians to open their world to the atmosphere outside. Even after the oxygen concentration was raised to acceptable levels, the biosphere remained sick. During the long months of crisis, Mission Control -- led by John Allen, the charismatic leader of Synergia Farms and the man whose obsessions birthed the biosphere -- attempted to micromanage every aspect of the crew's response to the disasters they were facing. Four of the biospherians were loyal to management; the other four felt that they should be able to act more independently: after all, they were in another world. By the end of their first year, this split was impossible to ignore. "This is the only situation I have ever been in that would drive me to drink, except there is no drink in here," Linda Leigh wrote in her journal. When a tour guide leading a group of students around the outside of the facility asked Leigh (by telephone) what they would need to be trained in, in order to work inside the Biosphere, she responded: "They must learn to work with people they despise in order to get a job done." Poynter later commented, "People were fired and unfired so often that it was almost as if John [Allen] and Margret [Augustine, Biosphere 2 CEO and co-architect] considered firing merely an extreme form of ordering someone to go stand in a corner." Once, while she was walking up the stairs, Alling and Van Thillo spat in her face. The factionalism was not limited to the inside of the biosphere. During the famine, Tony Burgess, the designer of the desert, testified to the Scientific Advisory Committee about the biospherians' mental and physical states; contra Allen's wishes, he did not sugarcoat the situation. Allen later told him, apparently in all seriousness, that "betrayal is punished by the lowest depths of hell." The music video below, created by the biospherians during their two-year mission -- dreamed up by Roy Walford, the crews' doctor and the only biospherian who maintained contact with the other seven, until his death in 2004 -- may give some insight into the best of times in the biosphere. Even so, it is quite strange, and several of the participants are visibly underweight. Spooked by the disasters befalling the biospherians, their funder, Ed Bass, called in a man whom he believed would manage the project with a steadier hand: Steve Bannon, then an investment banker and now chief White House strategist and adviser to the President. Bannon immediately began generating proposals to monetize the biosphere, including plans to open "Biosphere 3," a casino operated jointly with the Luxor in Las Vegas. Perhaps unsurprisingly, Biosphere 2 remained in the red. Under Bannon's direction, the second and final mission began. But tensions between the old management (Allen, Augustine, and the original crew of biospherians) on one hand, and the money -- Bass and Bannon -- on the other, soon reached a boiling point. On April 1, 1994, Bass and Bannon sent US Marshals to Biosphere 2 with a restraining order, removing the original management from the project. The seven biospherians of mission two, on hearing the news, thought it was an April Fools' joke. They were given the option to leave the project, but decided not to open the airlock. Two of the original crew -- Alling and Van Thillo -- snuck back onto the property under cover of night and, according to Reider, "smashed small glass safety panels to neutralize the Biosphere's air pressure, then threw open the airlock doors. They quickly left, then telephoned the biospherians, telling the crew that they now had the freedom to leave...however, the biospherians poked their heads out, closed the doors, and chose to go on with their mission...to Gaie [Alling] and Laser [Van Thillo], seeing bankers take over Biosphere 2 was like watching their world come under foreign occupation by an enemy." Alling and Van Thillo were arrested three days later, but were never charged. Allen, the poet, playwright, and dreamer who conceived of the biosphere, was included in Bass's restraining order and exiled from his promised land. He had mismanaged the project, but there is little to suggest that Bannon did any better. 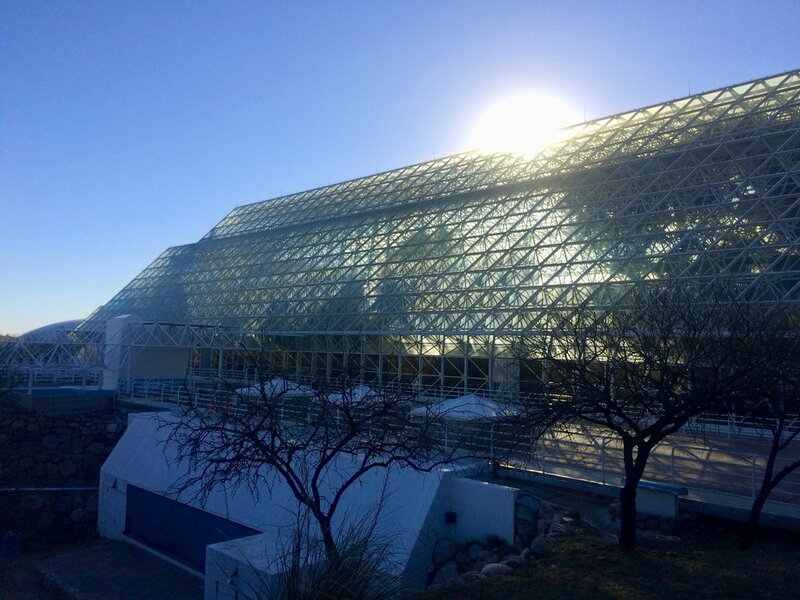 Allen had brought Biosphere 2 into existence out of sheer will and $150 million of his former friend Ed Bass's money; the two-year mission he oversaw reached its conclusion, albeit without meeting the parameters Allen had originally set for it. 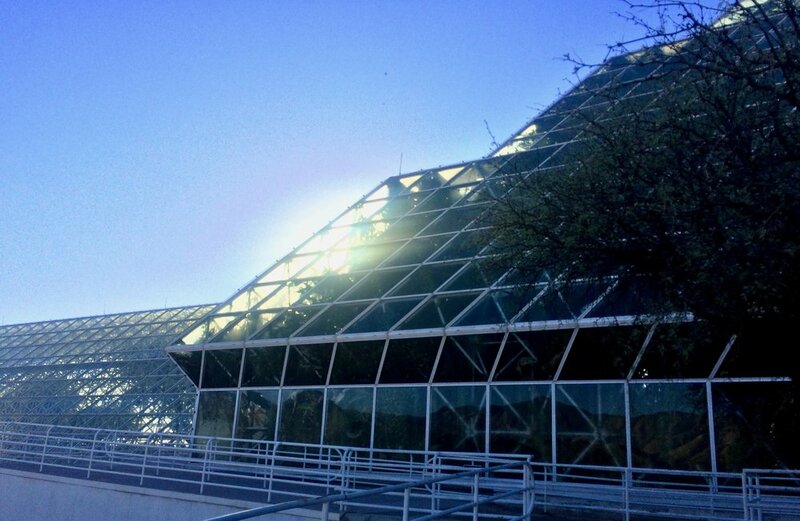 Under new management, Biosphere 2 was not able to complete even the single year mission it attempted. Where the old mission control had micromanaged the first crew of biospherians, the new residents of the biosphere found that Bannon and company could not be bothered to manage them at all. When Reider interviewed him, Bannon asked, "What was being gained by locking these people up for a year?" Six months into the second mission, the atmospheric concentration of \(N_2O\) -- laughing gas -- in the biosphere exceeded safe limits, and the experiment was declared over. As Biospheres 1 and 2 collided, the crew found themselves without a mission. But management was concerned with consolidation, not vision. Reider writes that Bannon and company "purged the staff of suspected loyalists" (an act with eerie echoes today), eventually asking a staff scientist "descended from the Cherokee medicine tradition, to ceremonially cleanse the place." Eventually they were able to persuade Columbia University to manage the facility (on which $200 million had already been spent), and Bannon washed his hands of it. A record of Bannon's tenure at the biosphere, immortalized via litigation, can be found in this Motherboard article. Unsurprising highlights include accusations of sexual harassment and threats of physical violence. When I toured Biosphere 2 last week, I was struck by the extent to which the original purpose of the facility has been erased. I was able to find two short videos, playing on a loop, which discussed the original mission; one in which Jane Poynter discusses the biospherians' "high-nutrition, low-calorie diet," and the other a video of the original crew members exiting the airlock after their two-year mission. Of the two pamphlets I picked up at Biosphere 2, one devotes a single line to the 2.5 storied years the facility spent as a sealed ecosystem. The other (which contains more information, as it is aimed at hearing-impaired visitors) does spend a paragraph on the original mission, referring to its end (due to nitrous oxide poisoning) as an "administrative decision ... made to change the direction of the program." The tour guide made almost no reference to the original mission, except for an oblique reference to the surfeit of trees in the savanna, which, he quickly commented, "were there to control the carbon dioxide levels." Indeed, he spent more time discussing the biosphere's high school summer science program than he did the facility's original purpose. When I asked about the history of the institution, he more or less refused to comment. Nonetheless, I highly recommend a visit if you are in the Tucson area. Most of the information I gathered for this post came from Rebecca Reider's Dreaming the Biosphere, which starts slow but is overall excellent. Many of the original group of biospherians have continued to have interesting lives. For example, Poynter has given a TED Talk in which she summarizes her time in the biosphere and discusses her new company, Paragon Space Development, which hopes to use her expertise in building closed ecosystems on the moon and mars. While the mission of the biosphere under the management of the University of Arizona seems unclear, they seem to be pivoting in a similar direction; for example, the lunar garden below is being exhibited in what used to be the biosphere's human habitat. Synergia Ranch, where the idea of the biosphere was hatched in the mind of John Allen, Margret Augustine, and their followers, now markets itself as a location for conferences and retreats; four of the original crew members still lived there, as of the publication of Reider's book. The Ranch's website seems to be managed by Marie Harding, once Biosphere 2's Chief Financial Officer, and includes a link to her CV and several of her paintings. 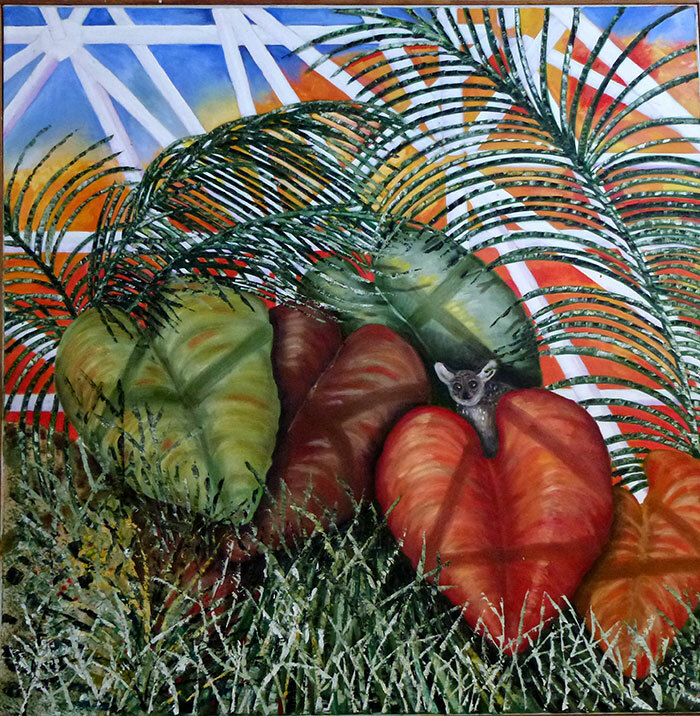 Some, like the one below, clearly depict the interior of the biosphere. Were the dreamers behind the biosphere foolish? Was their effort wasted? 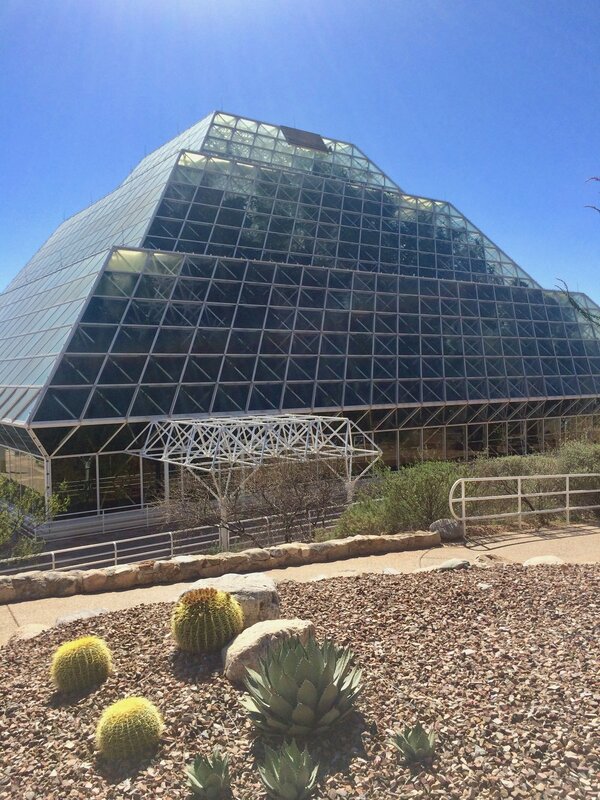 With their history almost entirely scrubbed from the facility, it's easy to think that the biospherians' legacy will fade into nothing -- that in the middle of the Arizona desert, a pyramid of glass will remain for a few decades, but will signify nothing but loss and inevitable mediocrity. I don't think that's what Biosphere 2 represents, though. Our world too is plagued by famine, strife, poor management, climate change, and selective memory -- some of it perpetrated by the same person who caused many of Biosphere 2's eventual problems. The difference is that our biosphere doesn't have an airlock. Honestly, I prefer the bumbling madness of the Biosphere's first mission to the corporate shuffle that came afterwards; the biospherians' determination to stick it out even though they couldn't stand one more second of each others' company; the willpower that let them continue while they could barely breathe. I think I understand the urge that made them try to retreat to a better world. I opened this post with Shelley's "Ozymandias." But I've always thought that the poem's fame undercuts itself. We do remember Ozymandias, if only through Shelley. And I think that even if we laugh at the biospherians, we can't help but recognize how our world echoes theirs; and our hearts can't help but ache for what they lost. And I think one should read the book with that comment in mind; of course the models the book complains about have some redeeming features and effects. But that complaint (which is prevalent in the Amazon reviews) misses the point -- to decide whether, on balance, they are a good thing, one has to have a careful accounting of their evils. This book is that accounting -- it makes no pretense at even-handedness and does not try to weigh the good against the bad, except in the most minimal way. I don't view that as a strike against it. I do have some mild quibbles with the book -- I think that in some cases, the book is uncharitable to the users of the algorithms it objects to. For example, on page 110, Cathy discusses the use of personality tests in job applications. Certain answers on these tests reveal that the test-taker has "high narcissism." "Who wants a workforce peopled with narcissists?," the text asks. This section is at best misleading -- as the author probably knows, the narcissism these tests discuss is not necessarily pathological. Rather, narcissism in this setting is a technical term, which may in fact be healthy. And throughout, the book offers the potential for abuse of algorithms as a strike against them (or offers anecdotal cases of abuse). For example, in the discussion of car insurance companies' use of opt-in technology that tracks one's driving habits, Cathy suggests that soon this technology will be opt-out, at a significant cost. I'm not necessarily skeptical that this will happen, but I'd argue that we should wait for the abuse to occur before objecting to the technology. In any case, I think this is an important (and excellent) book, and a necessary counterweight to the techno-utopianism to which I, and many in government (in particular in the current administration), business, and academia are often prone. I doubt the book will cure me completely of my faith in technocracy. But I think its real goal is likely to temper that faith with some skepticism. At bottom, the book advocates for rigor in modeling, and for internalizing negative externalities -- who can argue with that?